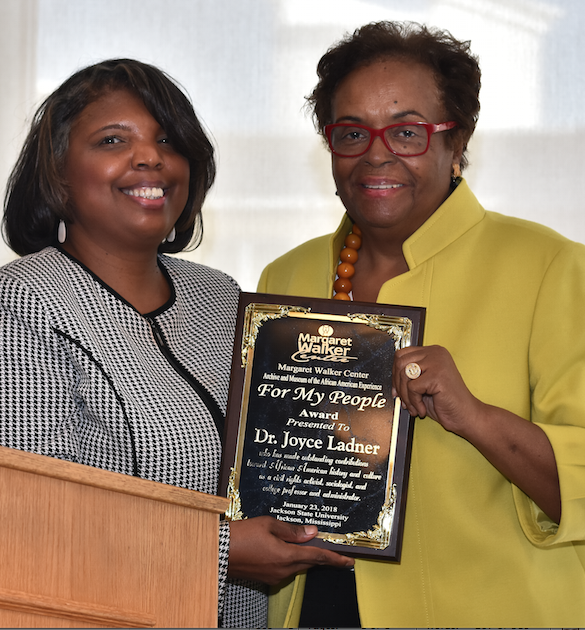 Dr. Joyce Ladner accepts the ‘For My People’ award in the JSU Student Center Ballroom. Immediately following the 50th -year celebration of the Dr. Martin Luther King, Jr. Birthday Convocation, Jackson State University’s Margaret Walker Center hosted its 23rd annual “For My People” awards luncheon in the JSU Student Center Ballroom to honor those for their exemplary work toward social justice and community service. Dr. Joyce Ladner, the keynote speaker for the MLK observance, was among this year’s recipients along with three others. This year’s four honorees were Dr. Joyce Ladner (a civil rights activist and scholar); Dr. Wilma Mosley Clopton (a founder of NMHS Unlimited Film Productions); Dr. Maryemma Graham (a Margaret Walker scholar); and Airea D. Matthews (a recipient of the 2016 Yale Younger Poets Award). Ladner and Mosley Clopton were in attendance to humbly accept their honor. Ladner expressed gratitude for being chosen as a recipient of the “For My People” award. After years of hard work and diligence, Mosley Clopton says she never thought she would receive such an honor for her efforts. “To be recognized for this award is phenomenal, and I feel so amazing. But, I literally still think they have the wrong person because I don’t do what I do for awards. So, this is very special to me,” said Mosley Clopton. The 2018 award recipients also were noted for their commitment to the public preservation of African-American history and culture. For more information, visit The Margaret Walker Center.